Here’s the relevant passage from his Wall Street Journal column. The right way is to help bring costs down by making care better and improving our health-care system. Improving quality while reducing costs is a strategy that’s had major success in other fields. Computers, cars, TVs and telephones today do more than they ever have, and the cost of these products has consistently dropped. The companies that make computers and microwaves didn’t get there by cutting what they offer: They achieved success by making their products better and more efficient. …Under President Obama’s framework, we will hold down Medicare cost growth, improve the quality of care for seniors, and save an additional $340 billion for taxpayers in the next decade. To explain, let’s start by looking at why relative prices are falling for computers, cars, TVs and telephones. This isn’t because the companies that make these products are motivated by selflessness. Like all producers, they would love to charge high prices and get enormous profits. But because they must compete for consumers who are very careful about getting the most value for their money, the only way companies can earn profits is to be more and more efficient so they can charge low prices. So why isn’t this happening in health care? The answer, at least in part, is that consumers aren’t spending their own money so they don’t really care how much things cost . As this chart illustrates (click to enlarge), only 12 percent of every healthcare dollar is paid directly by consumers. The rest comes from third-party payers, mostly government but also insurance companies. In other words, Berwick’s column accidentally teaches us an important lesson. When consumers are in charge and responsible for paying their own bills, markets are very efficient and costs come down. 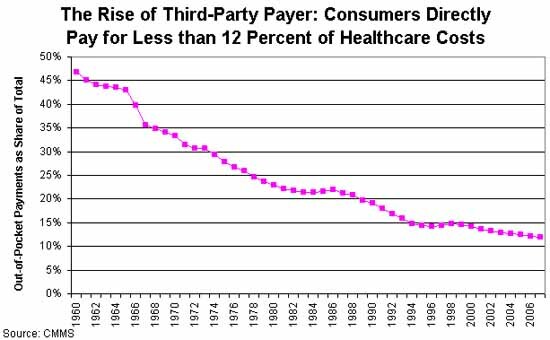 But when government policies cause third-party payer, consumers have little if any incentive to spend money wisely – leading to high costs and inefficiency. Defenders of the status quo argue that the market for healthcare somehow is different than the market for things such as computers. 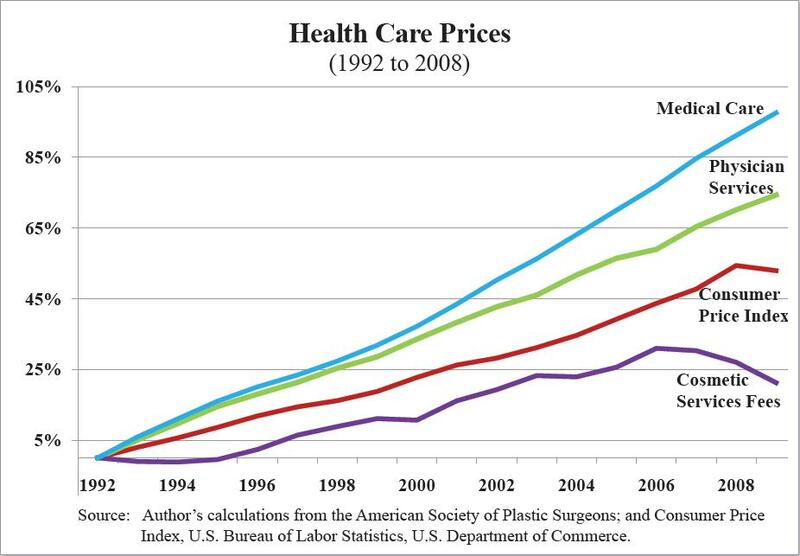 But here’s a chart (click to enlarge) showing that relative prices are falling in one of the few areas of the healthcare system where consumers spend their own money. And I’ve previously noted that the same thing applies with abortion, where prices have been remarkably stable for decades. Regardless of one’s views on the procedure, it does show that costs don’t rise when people spend their own money. That’s common sense and basic economics. But it’s not a good description of Obama’s healthcare plan, which is explicitly designed to increase the share of medical care financed by third-party payer. The White House presumably would argue that price controls will help control costs. And the President’s Independent Payment Advisory Board (a.k.a., the death panel) will have enormous power to directly or indirectly restrict care, but that’s probably not too comforting for the elderly and others with high healthcare expenses. Both President Reagan and President Obama had to deal with serious economic dislocation upon taking office. But they used radically different approaches to deal with the problems they inherited. Reagan sought to reduce the burden of government, whereas Obama viewed government as an engine of growth. So who had the right approach? 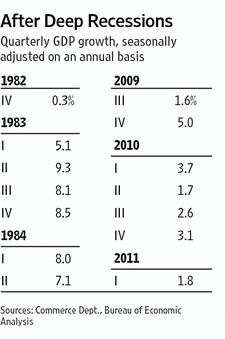 This image, taken from an op-ed in today’s Wall Street Journal, shows quarterly economic growth (adjusted for inflation) for the seven quarters after the recession ended. Most worrisome, the weak growth over the past seven quarters means the economy has not recovered the lost output caused by the recession. This is in contrast to past downturns, where a temporary fall in output was offset by a period of rapid growth when the recession ended. And since there’s no reason to expect a sudden boom now, this means a permanent loss of income for the American people. To be sure, we have no idea what would have happened in the early 1980s without Reaganomics, just like we have no idea what would have happened the past few years if America had taken a different approach. But when theory and evidence both point in a certain direction, perhaps it’s a good idea to at least consider the possibility that small government is better for prosperity than big government. Here are several from Jay Leno. The one about Biden is the best. The man who invented the teleprompter has died at the age of 91. When President Obama heard the news, he was speechless. A new poll shows that President Obama’s approval rating is down to 41 percent. A lot of people that voted for him now say they liked him a lot better when he was a Democrat. The United States is sending its most powerful drone to Libya. That’s a long trip for Joe Biden. Here’s a good one from Jimmy Fallon. Donald Trump said he still wants to look more closely at Obama’s birth certificate to make sure that it’s real. Incidentally, President Obama said the same exact thing about Donald Trump’s hair. Two funny quips from Jimmy Kimmel. The White House Easter Egg Roll is an opportunity from kids all over the country to come to the White House and look for the president’s birth certificate. Everyone knows that Santa Claus lives at the north pole, but no one cares where the Easter Bunny comes from. St. Louis International Airport was hit directly by a tornado. They determined that tornadoes are no longer a danger, and now we can go back to being endangered by sleeping air traffic controllers. And one final joke from Letterman. Today was so beautiful that air traffic controllers were napping in the park.